I am taking a break after trying to do my taxes with Quickbooks online, that way I won't loose it in a fire, hahaha. One year ago was our fire and looking back I think we did pretty well. I always think a tragedy big or small changes people and it is our choice to make it a positive change. For a while now I have been yearning to make home decor pieces instead of purchasing them, because I had all this Prima stuff that was calling my name I made this canvas. 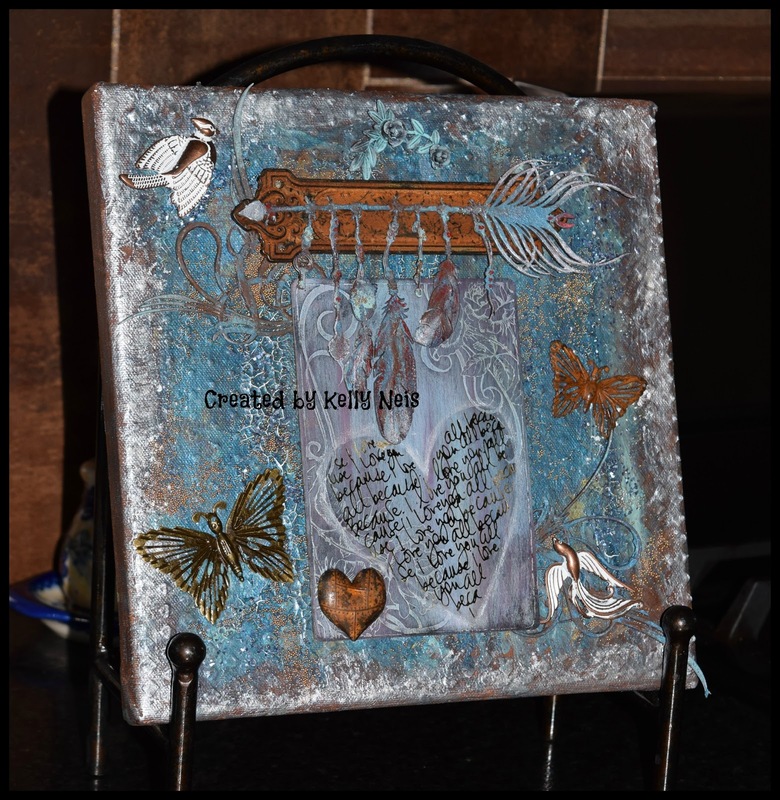 This is a 12x12 artists canvas from Micheals and after gesso I used Finnabairs honeycomb stencil and 3D Gloss Gel by Finnabair to make the background texture. 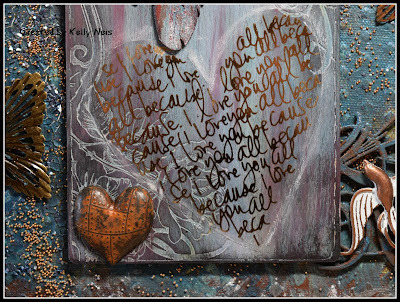 After it dried I painted on Dusty Attics paints in Mountain Meadow and Chocolate. 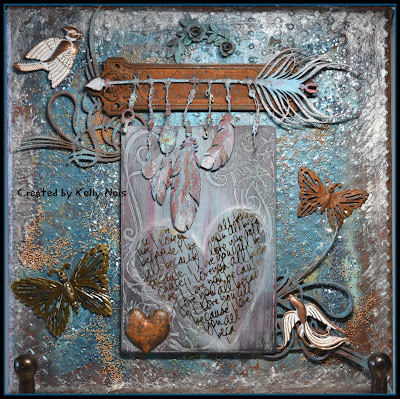 Then I mixed Soft Gloss Gel with Mica powders and Artisian Powder from Prima, copper, deep water, pale silver, and LaChapeleier, (which is on pre-order) and to top it all off I swirled Dusty Attics Crackle medium all over the top of the canvas. Quickly I dropped Prima Copper Microbeads and Turquoise Glass Beads onto the wet background and let it all dry. 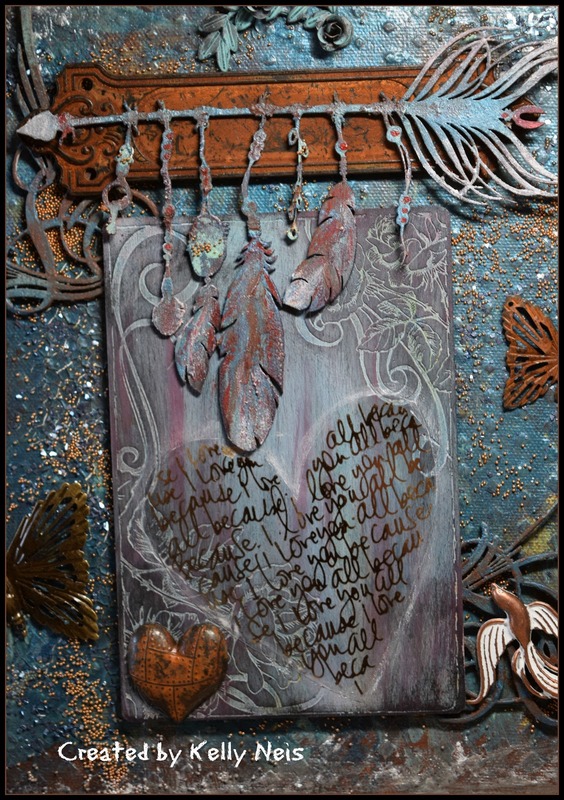 I chose 3 Dusty Attic Chipboard pieces, a thin wood board with a floral pattern in it from a friend and gessoed them all. Then I lightly coated them with the Prima Mica powders until I was happy and then lightly brushed on Golden Cadium Red Medium Hue mixed with Copper Mica powder to created a rustic red color. 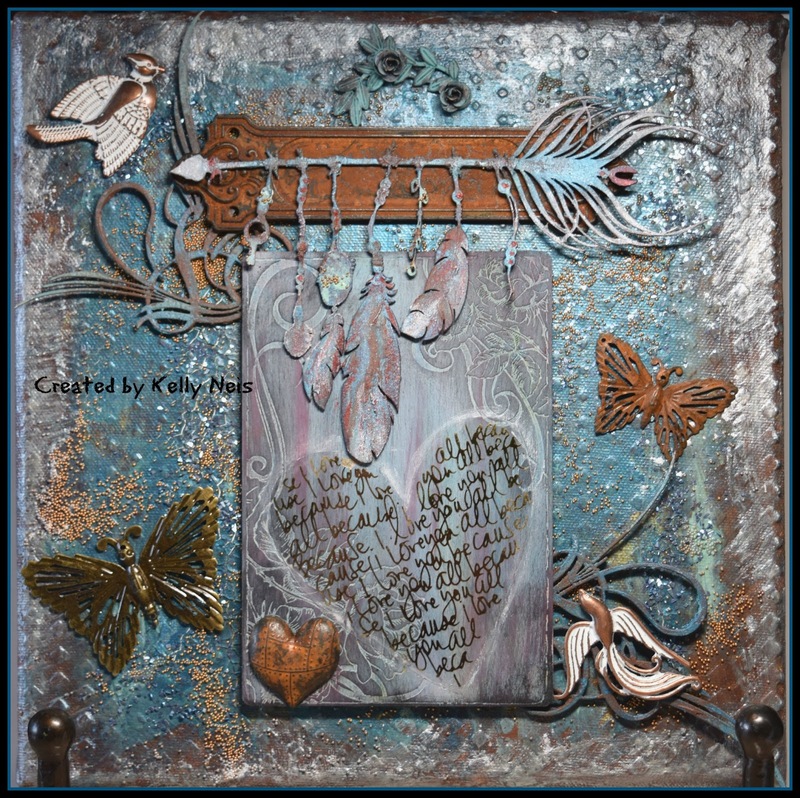 The heart is a clear acrylic piece with gold writing that someone had given me so I cut around it and super glue gelled it on and then put the pale silver Mica powder around it. Here it is sitting on my metal easel in my kitchen. My hubby just installed this metallic coppery backsplash and so of course I had to make something to compliment it. Thank you for stopping in and I hope all those links help you find products. I am not affiliated with any store but these are the ones that carried all the products I used for my canvas. Love Love Love! You did amazing job. I love the colors. Beautifully done. 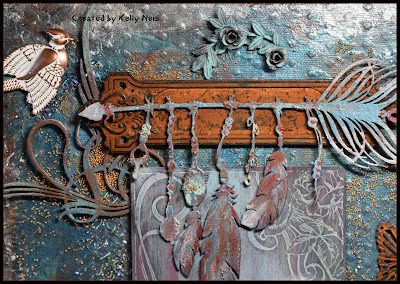 What an amazing canvas, Kelly - reminding me how much I love your mixed media work... 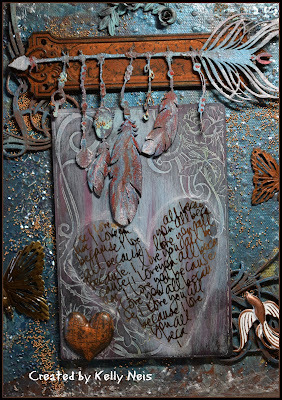 I love the colour tones, and fantastic use of all those Prima bits and bobs, beautifully altered and distressed. I love that scribbly heart! What a long way you've come in that year - well done for seeing it all through with such grace and strength.